Since the closest bike path to me is 35 miles, I do a lot of road riding straight from my driveway though cars fly up and down my country road like it’s the Autobahn. While the roads out here are fairly straight, there are many hills near my house which when you are not a light person, are a bit of a struggle. Cue in the wind and I’m usually always struggling on the road while feeling like giving up at any moment. While I suppose it is making me a stronger rider, I don’t enjoy the ride as much and so it becomes a chore to even get my bike down off the rack and push it out of the garage. 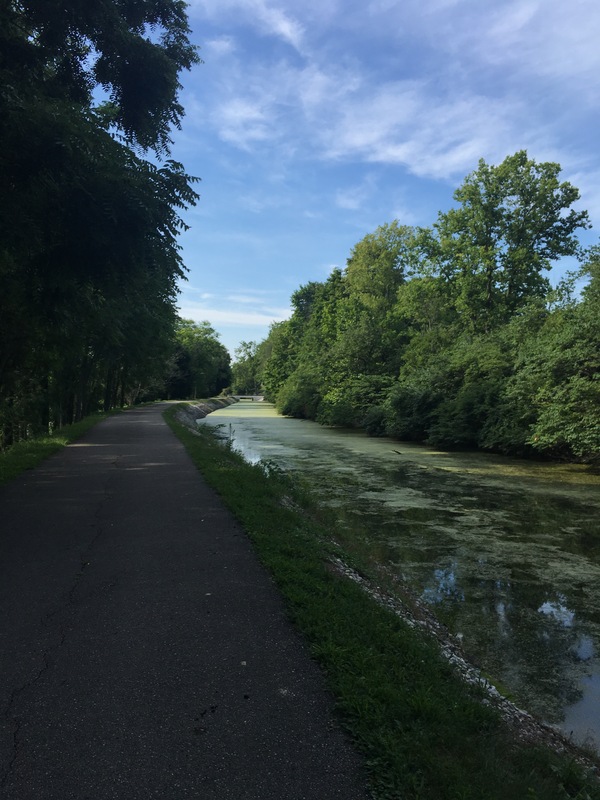 Lately, I have been trying to reach my weekly mileage goal by peicing together 4-5 shorter rides where I used to do two longer bike path rides a week. This adds to the ‘chore’ feeling of riding. I’m simply meeting a goal and am not really enjoying my ride. Plus the I’m gearing up 4-5 days a week rather than a few. Though some cycling enthusiasts will say you should ride most days of the week, I’m not feeling like I’m getting anywhere fitness-wise. Plus, I would like to do more walking or hiking, maybe put in a swim at the lake. I’m not sure my knees are up to daily riding, I seem to do better riding several times a week for longer stints than fighting hills for 4-5 rides. Today, I had an early morning appointment to get the oil changed in my truck 10 miles away from the closest trail so I tossed my bike in. I figured, I’m that close, might as well ride the path. The heat across the country has been oppressing, and even though it was only 845 a.m., the temperature was a very humid 84 degrees. I chose the shadiest section of trail and started at the closest parking lot. Though the parking lot was in the sun and I was sweating before I even clipped into the pedals, I felt that I was already looking forward to the ride. When I ride down my driveway, I am not usually excited to ride, but I feel more like it’s a forced march. As I crossed the road and passed the dry creek bed, I slipped into the shady wooded area in some of my favorite trail sections. Instantly, I am in my happy place. I love the dappled shade, the twist and curve of the path, the river running near, the older couple who say good morning as they ride by, the little dog who sits and waits for me to pass, the black wrought iron benches placed at scenic spots, the downtown buildings, the different bridges I cross, the cemetary that reminds me that life is short, the white mansion that sits on the hill, the small quiet lake, the city parks, the mother pushing two young children in a double stroller with a third child strapped to her chest, the lady jogging who gives me a pained smile, the barefoot fisherman, purple lupine, dame’s rocket, Queen Anne’s lace and the miles that seem to pass without my notice. Okay that is a huge run-on sentence, but that is just a few things I loved from today’s 22-mile ride. While I rode today, I wondered why have I been killing myself on more frequent, shorter road rides. Why not just put in two longer rides on the bike path even if I do have to drive an hour round trip or longer? If it means I enjoy cycling more, then shouldn’t I do that as much as possible? Fill in with road rides when I need to. When I am out riding on the road, I am worried about cars hitting me, fighting harsh pavement conditions, big hills, no shade and really not a lot of to engage my senses. Miles and miles of crop fields broken up by the occassional home or farm. I worry about dogs chasing me or weird strangers slowing down and abducting me while I ride out in the middle of nowhere. I carry dog spray (pepper spray that shoots far) more for people than dogs. Not that you don’t run into the occassional weirdo on the bike path. There have been moments when my spider senses go into hyper drive but usually there are people around moreso than riding in the country. Not that you can’t have an accident on a bike path. You still should wear a helmet and pay attention. I’ve had two bad accidents on a path. The first one was an ambulance ride and a concussion because I wasn’t paying attention (didn’t I just warn about that!). My front tire had slipped off the pavement causing me to go end over appetite crashing head first into the pavement (why you wear a helmet). The EMTs had to drive back in a pickup truck becuase there was no way to get an ambulance to me. That was certainly an expensive mistake. The second time was hitting a suicidal racoon that darted out of the woods. Hitting him was like hitting a brick wall which again sent me head over heels and to the ER to later find I had a separated shoulder. So, while cars are usually no an issue unless you are crossing roads, you still have to be really careful and alert. That aside, I am a big advocate for bike paths and bike lanes. They help keep us safe from vehicles though they aren’t bullet-proof. The paths normally wind through interesting scenery and take you to places you may not normally see from a car. It gives you the opportunity to interact, even if it’s just a quick hello, with other cyclists and exercises of all walks of life and ages. They provide normally a fairly flat surface to ride or walk or run. They help us get or stay fit. Bottom line is that bike paths are a great asset to every community. Davey Woods SNP is located in Champaign county at 7661 Lonesome Road, St. Paris, Ohio east of Piqua, Ohio. I love the name of the road. It is a very quiet and fitting for it’s moniker, Lonesome. This is a 130 acre wooded tract with almost 2.0 miles of trail that winds up through gentle hills of old-growth woods. 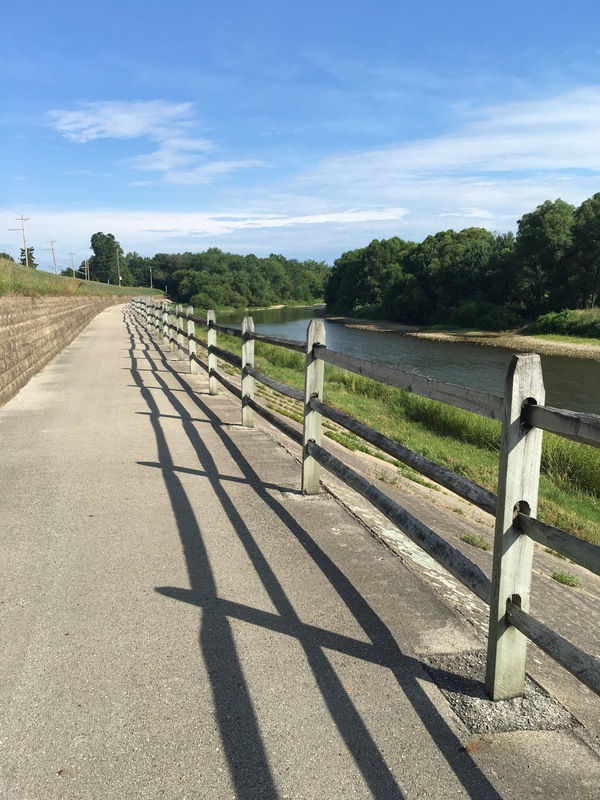 The Conrad Trail is 1.4 miles and the Short Loop trail is 0.6 miles. There is a gravel parking area right next to the road with the sign proclaiming that this is indeed Davey Woods. There are no facilities and no pets allowed. Bring plenty of water. To the left of the signs, you walk down a wide path in the woods that was once a road bed now grass. In mid-July everything is a beautiful lush green as we have not had any dry spells yet. You come to a kiosk which has the trail map on it and you can elect to go left or right. We chose left because we saw a dark wood bridge. The bridge always wins. There is also a small donation box with the kiosk if you so choose to help fund these great preserves. The bridge crossed a small creek and headed up into the woods. The trail is well traversed, very shady and I am sure offers wonderful wild flowers and beautiful fall foliage in other seasons. 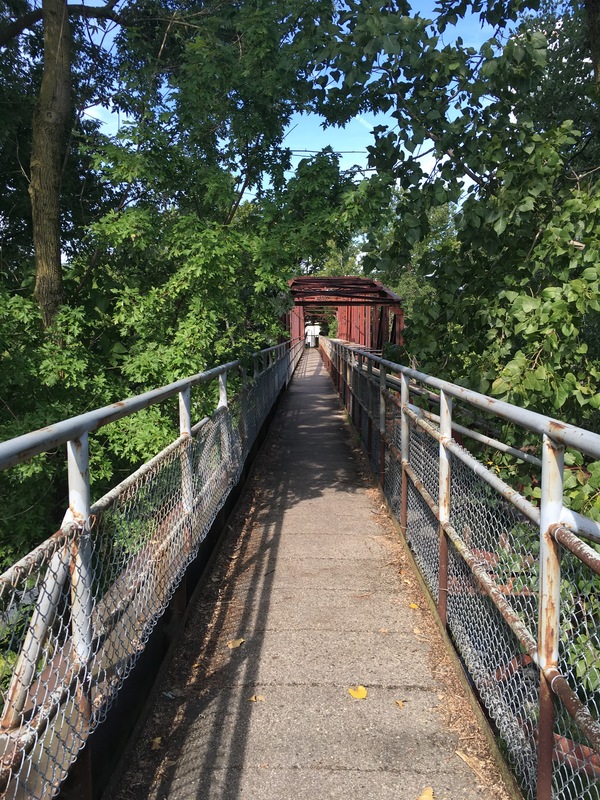 There are several small bridge crossings as the trail winds up through the trees and hills. Quite simply, we walked on an extremely hot day but did not feel the heat within the woods. Of course you want bug spray and sunscreen even though it is shady. The trails give you a bit of challenge going up and down but mostly they are moderate and easy to traverse. Short Loop breaks off of Conrad Trail so we only did just Contrad Trail this trip. We want to return soon to do both trails we enjoyed this nature preserve so much. It reminds us a bit of the Lake Hope area, with very large trees such as oaks and tulip trees. There was no one on the trails with us that day and only one spot of Conrad trail had a little bit of road noise. Otherwise, you are ensconced in the sweet peacefulness of wooded bliss. Toward the last part of the loop back to the kiosk area, we climbed a hill and came across a little surprise. Three old gravestones which had been set flat into concrete to protect them in the place in what the sign stated was the Pence Family Cemetery. David Pence and his wife, Barbara, moved to this spot from Shenandoah County, Viriginia in the early 1800’s. We had to pause and pay our respects as well as read the gravestones which were worn by time and the elements. At this point the trail started to descend and brought us out on the other side of the kiosk. We could have extended our hike by taking the Short Loop. Quite a pleasant trek. We will certainly do this one again as it has beautiful and quiet woods as well as enough trail length and challenge to break a good sweat. This one is good for anyone in relatively decent shape as there is ups and downs over the hills but I would not call it much more than a mild hike for the average person. You do feel though as if you were transported into an era before even the Pence’s settled the land. One of my favorite preserves so far! 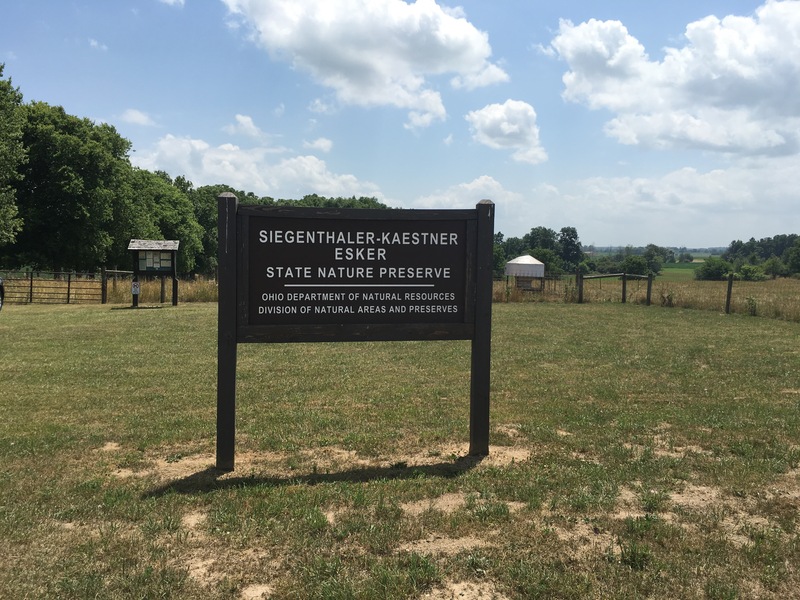 Siegenthaler – Kaestner Esker SNP is located near West Liberty, Ohio, at 5505 Couchman Road and consists of 37-acres which contains an esker, kame and kettle which are glacial landforms which I had never heard of or learned in school and completely forgot. Esker – long, winding ridge of stratified sand and gravel deposited in layers according to grain size by running water with steep sides and a sinuous shape. Or to me, a long narrow hill. Kame – Knolls formed by piles of gravel that were dropped into pits and crevices in the glacier when meltwater streams flowing on top of the ice. Or as I would call them, small hills. Often associated with kettles. Kettle – A pond formed when a block of ice remained and surrounded by till. When the ice melted, a depression was left and filled with ground water. Or to me, simply a pond. In other words, geology buffs will love this glacial area or simply nature lovers who like a gentle stroll in a quiet area. We literally drove right by this preserve and had to turn around and go back. The parking area is a grassy area which you can easily miss for a field. You park in the grassy area, driving through a narrow former gate area between two fence posts, where there is a sign and kiosk for the preserve. Like most preserves, there are no facilities. Remember to bring water, bug spray, sunscreen and pack out any trash. Don’t remove any natural materials. Pretty much the same instructions for most nature preserves. Oh and no pets. The trail is like a lollipop and approximately 1 mile long depending on if you decide to also traverse the summit of eskers as well. 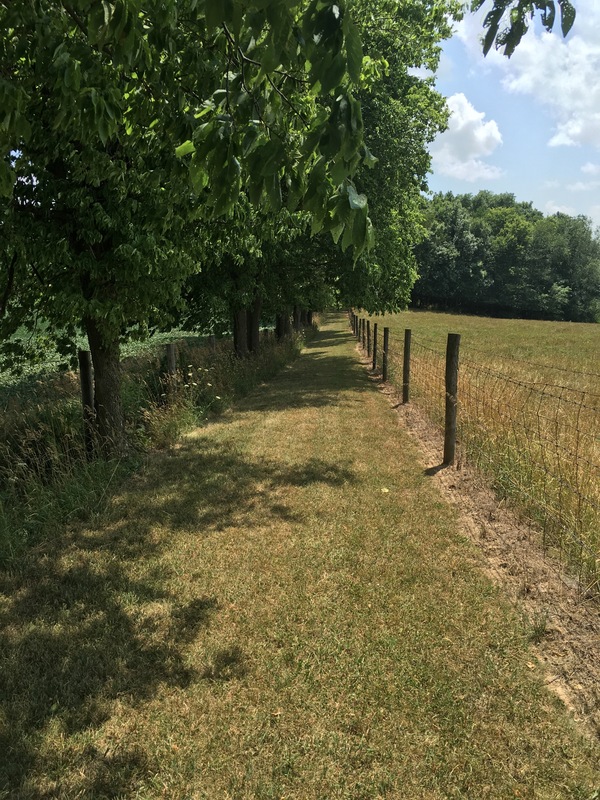 The initial part of the trail is much like walking along a narrow, grassy country road with fence on both sides. One side during our hike was a crop field (soybeans) and the other side appeared to be a livestock field, probably cattle. There are mature trees on one side and then you slip into a more wooded area, make a sharp right turn and down a hill to where the trail tees at the first esker. You can go either left or right, the trail will loop around to itself. The day we visited, the trail had been recently mowed but be cautious of the poison ivy if you go during the late spring to fall months. I am beginning to think the state plant should be poison ivy. We turned right initially, choosing to walk in the more open sunny area first followed by what seemed would be more shady. The day was hot but not unbearable as there was a nice breeze most of the time. One we rounded the first bend in the loop, we took the trail that went up to the summit of the first esker or hill to me. You can see larger rocks where they have mowed a trail among the grass meaning that the heavy rock was deposited on top. Again, be cautious of the poison ivy. The hills are narrow and long and there are two of them with old trees, such as oaks growing there as well as many wild raspberry bushes. 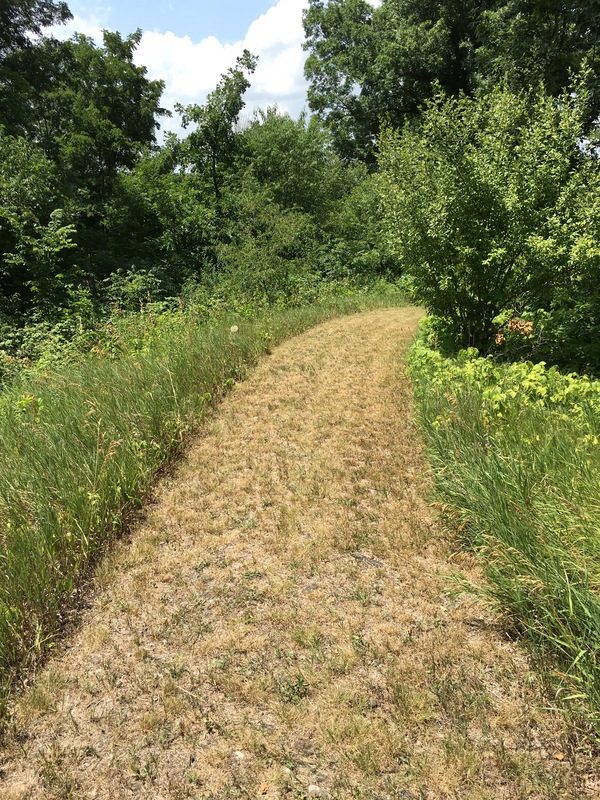 When we went down the first esker, and came around to the trail going up the second one, we decided it looked too overgrown with poison ivy to chance walking the top so we chose the lower trail that went between the base of the hill and the fence. 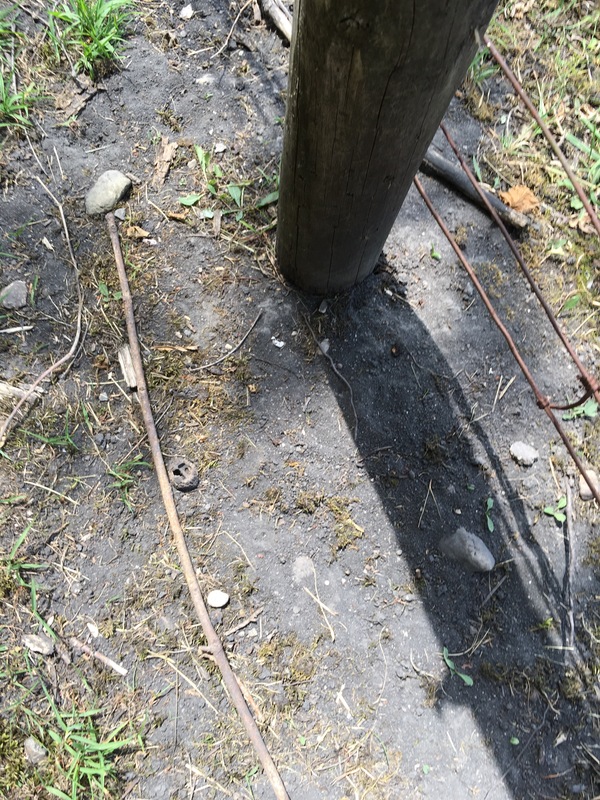 As we walked, we noticed the dirt that was exposed was black and sandy different from the brown dirt we saw on the other portion of the trail. Curious, we bent down to touch it and it was soft and silty which means the finer till was deposited on the bottom of the esker. 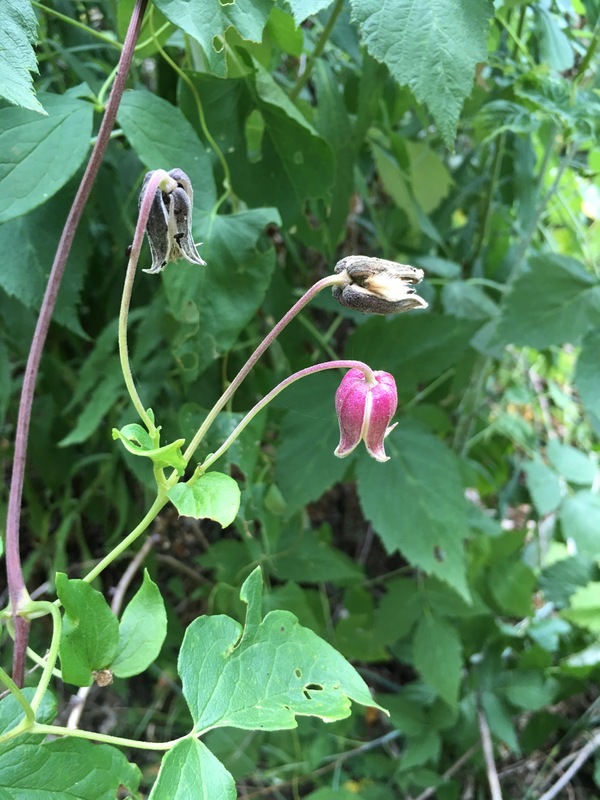 Admist the thick growth we saw wild delphinium, a white phlox and a red bell type flower growing on a vine. When we rounded the far side of the furthest esker, the trail became more overgrown with thistles and a grass (and poison ivy) so we had to be careful to step around the plants otherwise the thistles would have scratched us. You return to the start of the loop and turn back right to return to the parking area. Due to the overgrowth of poison ivy, this may be better an early spring, late fall or winter hike or if you are brave like us, you just go and dance around the poison ivy. This is a pretty area, open and peaceful. If you have an interest in glaciers and/or geology, this is also a good place to visit. It could be an easy stroll with kids though again, poison ivy might be a concern, maybe older children. The trail is about half shad and half sun so if it’s extremely hot, you may want an earlier morning hike or later evening. Open dawn to dusk. 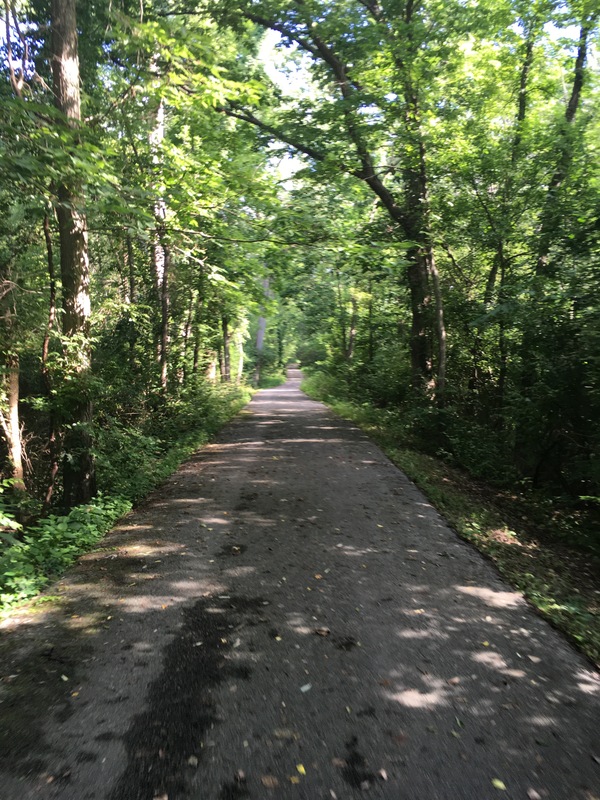 Our first adventure was the nature preserve closest to our home, the Gross Memorial Woods in between Botkins and Jackson Center, Ohio on Botkins Road. 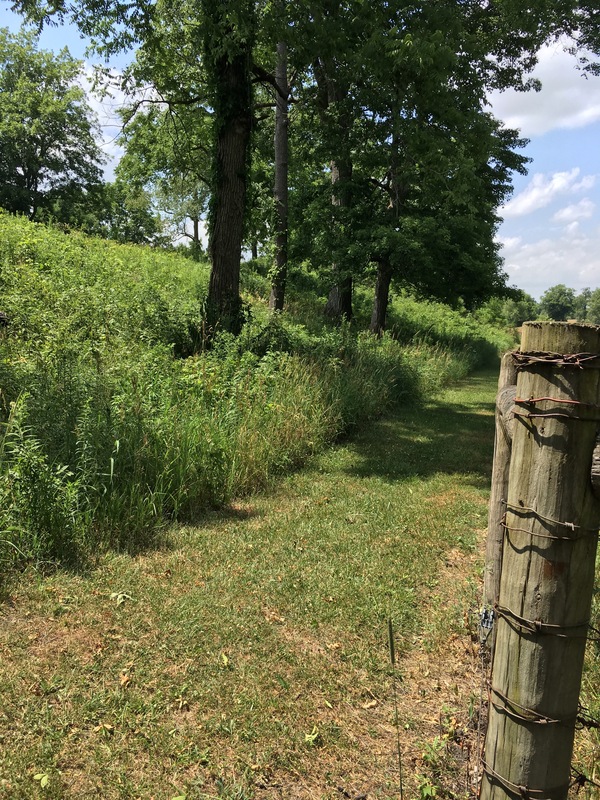 Location: Botkins Road, Shelby County, Jackson Center, OH 45334 – 6 miles east of I-75 on Botkins Road or 3.5 miles north of Jackson Center. 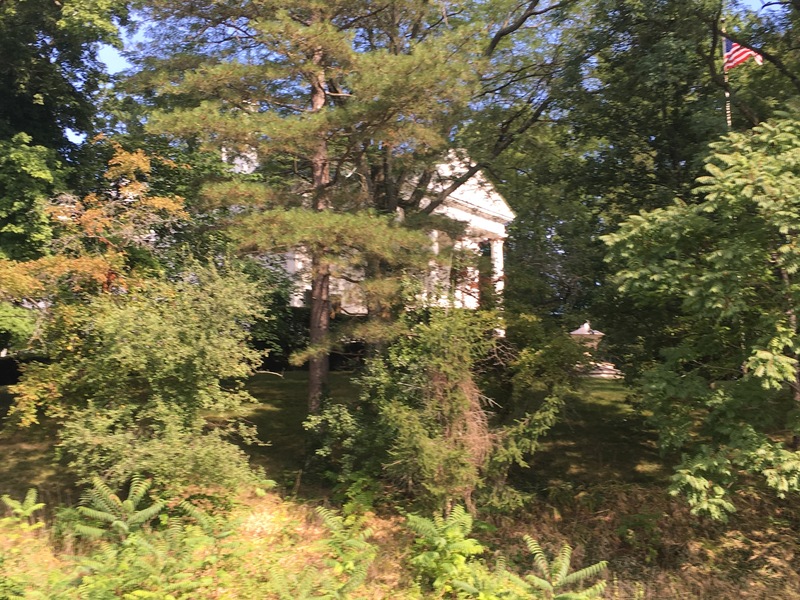 Acreage: 49 wooded acres. Trail: ~ 1/2 mile loop wood boardwalk. Suitable for families – more rugged strollers may traverse the boardwalk. Level, easy trail with three benches along the loop. Parking: a small gravel lot allows for multiple cars. An informational kiosk stands in the parking lot next to the start of the trail (trailhead). 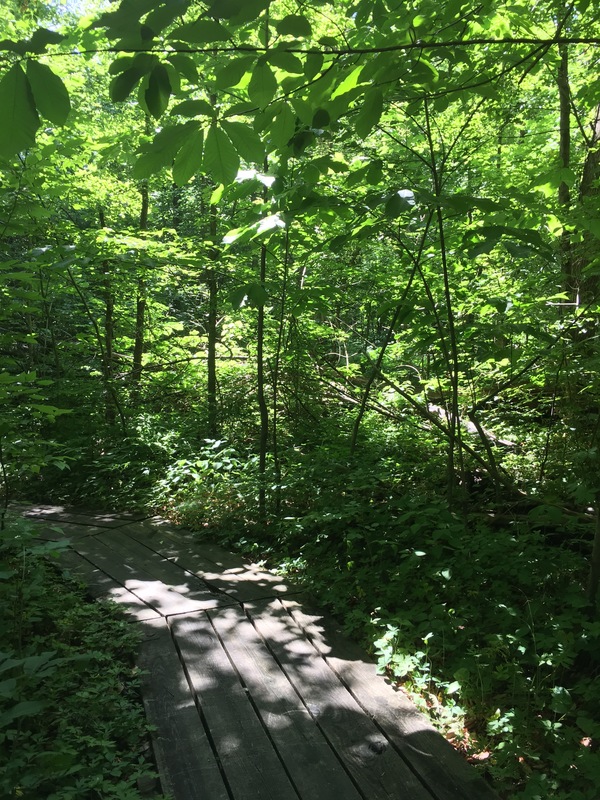 Cautions: No pets allowed, no picking or removal of natural items, boardwalk will be slippery when wet, some boards on the boardwalk need replaced so watch your step, some poison ivy near the benches and trail, marshy area – bring bug spray, no facilities (bring water, etc.). Review: Gross Woods was a gift of Samuel Gross in 1980. 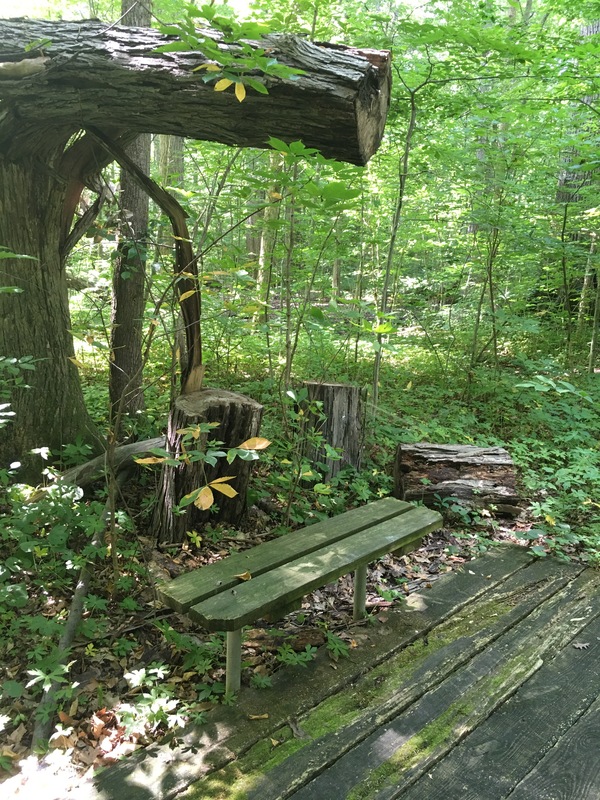 According to ODNR’s site, it is a good example of old-growth woods in west central Ohio and also home to the rare pumpkin ash tree. I’m not sure what a pumpkin ash looks like but now that I have read about it, I am definitely going to try and locate one on my next visit. My visits to Gross Woods have been mostly undisturbed by other visitors and you almost always have the place to yourself. Remember bug spray, even in the early spring, insects seem to be plentiful here due to the marshy area. You enter by stepping onto the boardwalk and being immediately shrouded by trees. In the spring, there are multitudes of wild flowers, so many that I had to get out several of my wildflower books to identify them all. We found different types of trillium, jack in the pulpit, hepatica, blood root, phlox, mayapples to name a few. While the woods sits close to the road, there isn’t a lot of road noise and since the area is rural, you can sit on a bench and enjoy the peacefulness of nature. You will hear a lot of rustling in the leaf litter on the ground under the trees as this is also home to many salamanders and skinks. Once it gets warm, if you look closely enough and are stealthy, you may just see one. I’m terrified of snakes and am sure they live here in this woods but I am always relieved to find out the rustling is something bearing legs. Though the boardwalk is only 1/2 mile long, I will do the loop first clockwise and then repeat it counter clockwise. Walking both directions is a great way to see even more on your visit. While it seems like the landscape doesn’t alter much, there is so much to see in such a short walk. Trees that have fallen over which have a line of plants growing on the top side of their trunks almost remind me of something you would see in a Lord of the Rings movie. 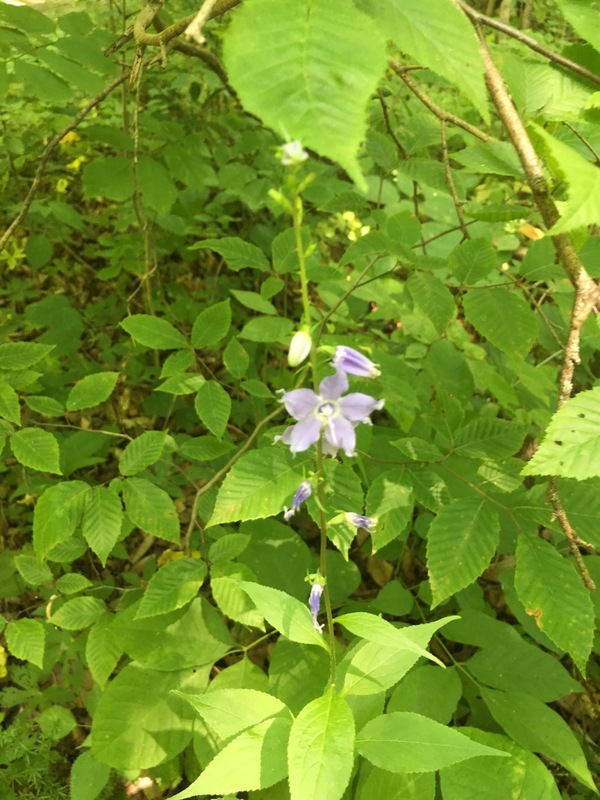 Even mid- July we found some flowers blooming such as delphinium. We saw a salamander or skink with light blue coloring. I am no expert on reptiles but it sure was cute as it shyly skittered back under the leaves and out of our sight. There is plenty of shade as the tree canopy is very full above you, though I would still wear sunscreen to be safe. The boardwalk is wide enough you can walk side by side with another person making it a pleasant place to chat while you stroll. However, you need to keep an eye on the boards, as a few of them could trip you up but overall as of July 2016, the boardwalk was in pretty good shape. If you love peaceful woods, vibrant green in mid-summer or full of wildflowers in the spring, this is a great place to visit. It is a good place for those with limited physical fitness due to illness or age, etc. with three benches that are spaced at good intervals to allow a place to rest. 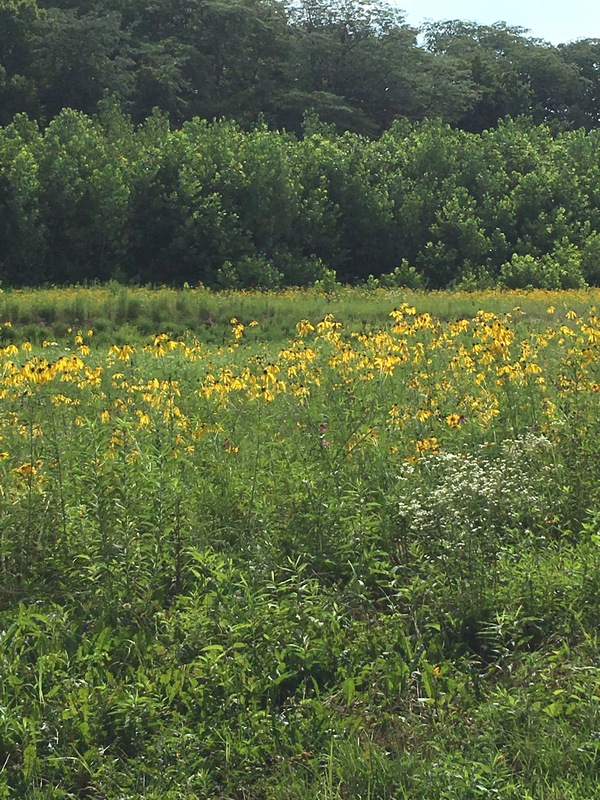 A short walk, plenty of wildflowers in the spring, quiet and little interruption from other visitors makes this one of my favorite nature preserves. So I’ve been lacking ideas for posts. I go back and forth and around on what to write. Today my youngest daughter and I decided to go do some hiking even though it was going to be in the 90’s, we figured if we could find wooded trails, it wouldn’t be too unbearable. There is a small preserve not far from my home, that is set into a woods with a half mile boardwalk. 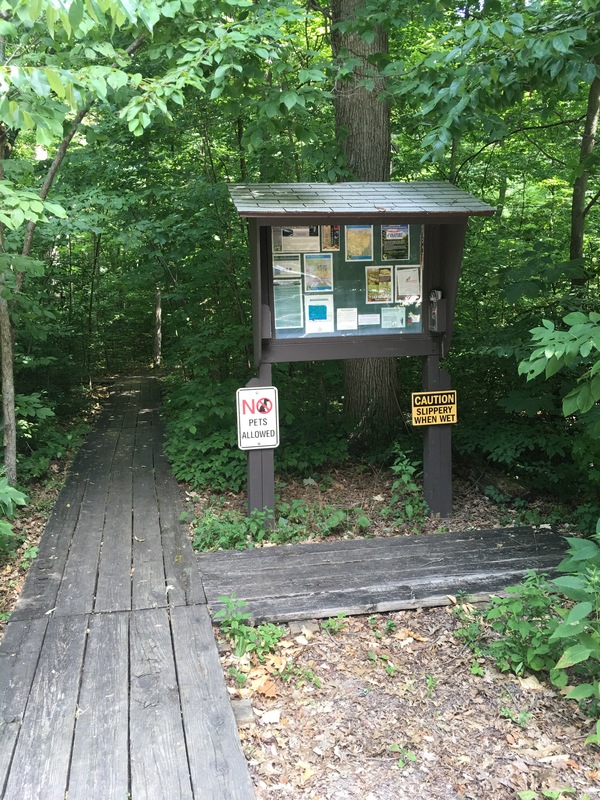 At the trail head, there is an announcement board/kiosk with information regarding the preserve plus a brochure on Ohio Department of Natural Resource’s (ODNR) other preserves. My daughter picked on of those up on our way back out to my truck. We were sitting in the air conditioning trying to decide what to do next. On the last page of the brochure is a map of Ohio with all the current preserves pinned on it with each preserve’s name. We realized we hadn’t been to most of these places on the map and the idea for a new blog direction and many possible adventures cropped up in our mind. We would visit them, take pictures and write a review of each preserve. To us, they feel like little hidden gems that usually are empty of other people, though some preserves such as Conkles Hollow in Hocking Hills are much more well known. We, being the lovers of solitude in nature, gravitate toward lesser known and used areas and are excited to explore these areas. 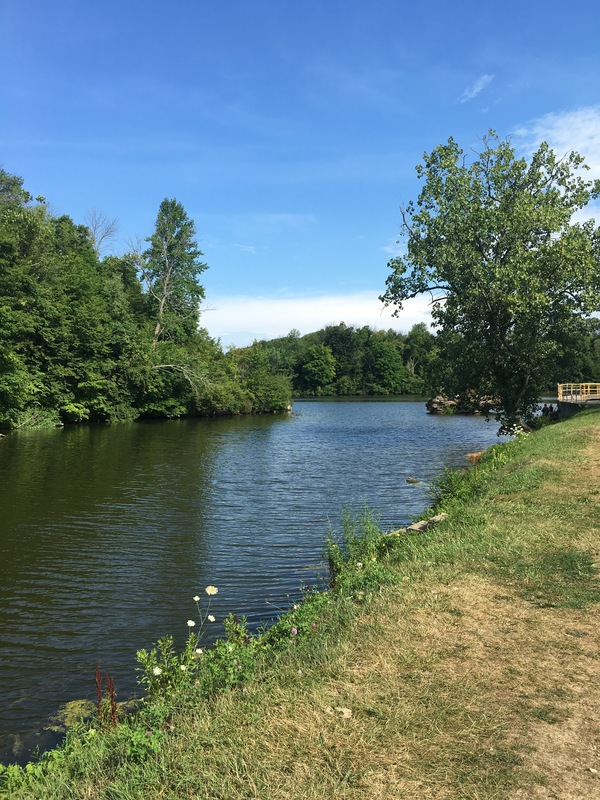 Ohio’s nature preserves in general do not allow pets, they do not usually have any facilities such as bathrooms or water and you must pack out your trash usually. Some may not even have clearly designated parking areas (you may just pull off the side of the road). Trails may be somewhat more rugged and less maintained. You are not allowed to pick or remove any natural items such as flowers or rocks. However, you will find a varied landscape in each preserve along with endangered species of plants, insects and birds. This land is set aside to “preserve” what is left of unsettled or reclaim formerly settled lands to their natural state. According to ODNR there are 136 nature preserves with ore than 30,000 acres in the great state of Ohio. Partners such as businesses and groups as well as volunteers assist the state in keeping these lands available for our enjoyment and use. Most of the time, you probably just drive by a nature preserve without even realizing it. They are usually only marked with a dark brown sign with white lettering and a kiosk/ message board. There is no big sign announcing their presence such as Ohio’s state park system so you have to look just a little bit harder for a preserve. Sometimes, you pull into the parking lot and are hesitant to explore because the area isn’t developed like state parks or metro parks may be. The goal is to preserve the land and leave it as untouched as possible by humans while letting people enjoy the land as well. 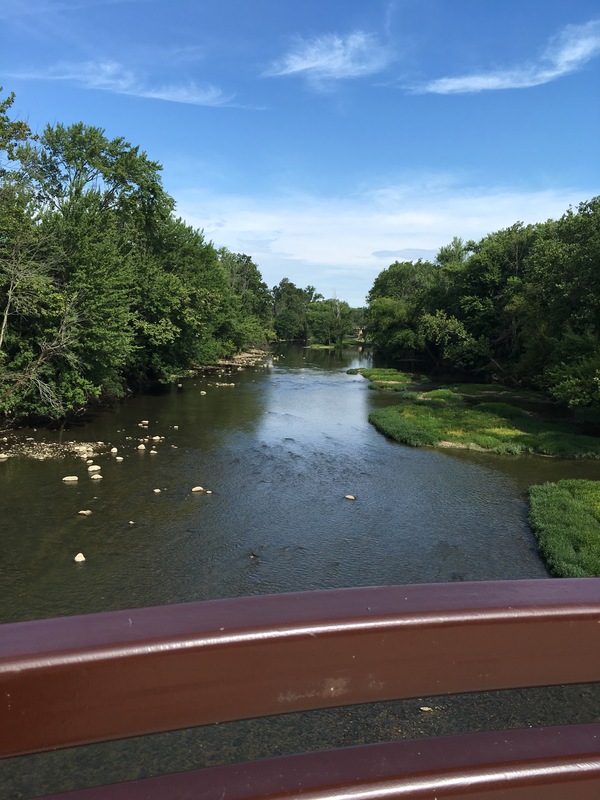 As we (or me) explore each nature preserve, I will update this post to include the preserve’s name as well as a link to the review post for that particular park. I hope you enjoy this adventure with me as I have already started and have found as my daughter state, some hidden gems, we had no clue existed. Just remember to pack plenty of water and prepare for minimal or no facilities. Happy trails! Yesterday morning, I woke up to a rainy foggy July 4th day. After having family and friends over the day before, I was in no hurry to get out of bed. A decadent lazy morning where I didn’t have to be anywhere except to pick up my dog from the kennel. These are mornings I love to read, or scan social media or nap or maybe even daydream. My thoughts turned to my writing. I haven’t been writing blog posts in the frequency that I once did, mostly because my life is quiet at this time, I’m not dealing with any major issues, I’ve explored all the other things I felt were relevant to share. There is only so much one can write about their life and its challenges. Then I thought I should work on my novel which I haven’t touched in a month. Then I started thinking do I really want to write a novel? It took me ten years to finish my degree but I never quite quit on it. Life’s challenges had made it more difficult but once I finally got the space and time to finish, I did it. The one thing I understand about myself is that when I truly want something, I will keep persevering and pursuing until I finally achieve what it is that I want no matter how hard it is. Which made me think, then if I am not really fired up and writing with all the time I have free now that my college classes have ended two months ago, is it truly something I want to do? When you have a bit of talent to write, what do people tell you? “You should write a book and get published.” Or something to that extent. That’s what writers do. Isn’t that the end all be all goal of a writer? To write that bestselling novel or non-fiction book? Make a lot of money, get famous, go on book tours, talk shows, and the like. Sounds glamorous doesn’t it? I used to think that I wanted that life. I follow some of my favorite authors on social media and they post what they do during their day, their book tours, their meetings with editors and so on. They fly here and there, go on cruises with their fans, some spend time in libraries and bookstores doing readings and book signings. I read their posts and think well that’s nice but have no desire for that kind of life. A good portion of being a successful writer is marketing your book. That part bores me to death. What would happen if I let go of the dream of becoming a best-selling author? The first question I had yesterday was is becoming a best-selling or successful book author really my dream? I know myself, if it was, I would have pursued it and made it happen or in the process of making it happen. I would have networked with agents, joined writing groups, writing organizations and attended writing classes or workshops at a higher level. I used to think that I was afraid of rejection but when I read books, I find myself thinking my writing is as good or better than this writer (my opinion of course!). I’m not some great writer of prose with elegant sentences and flow but reading what is climbing up the New York Times best seller list, a lot of those authors don’t have that rare talent either. They write what sells, what people enjoy reading. There are books on formulas on how to write to get published, etc. That seems to take away some of the joy of writing to me. Obviously I’m not wanting to write to make money. Sure I wouldn’t turn money down but I write because I love writing. If I have to write in a very specific way to sell it, then I might as well clock in at 8 a.m. and clock out at 5 p.m. just like any old job. That’s all it would be. The creativity and sheer joy of dreaming up an entire complex story complete with characters I bring to life would no longer exist and therefore the reason I write would be gone. I write for my own enjoyment. I always have. I suppose that means that maybe the dream of being a best-selling author isn’t my dream at all. It’s just what a writer is supposed to strive for, what makes sense to everyone else. Getting published on a large-scale is the benchmark of a good writer except I’ve read plenty of books and thought, ‘How in the hell did they get published? This is awful’. Publishing is simply a business. Just like any place you work, it could be who you know or what you are willing to do and bend for to get what you want. Which is fine. I am not criticizing it but I am starting to realize, maybe I need to rethink my dream. When I thought about letting go of the whole publishing a fictional novel idea, I felt a weight come off of my shoulders. This doesn’t mean I may never write a book, just maybe what I am writing isn’t the right thing for me. I get a lot of enjoyment out of writing my blog especially when I write about something particularly difficult for me and someone comments to be how it helped them or made them feel less alone or it gave them information on how to seek help. That is way more satisfying than the few times I have become published on a smaller level. I need to think about this, listen to this aspect. When you first get published, even on a small-scale, it’s exciting and by the next day, the excitement for me was gone. I don’t go around bragging that I published in this or that. Not that I really have anything to brag about. I don’t feel I have to prove anything to myself or anyone else any more regarding my writing. When I was younger, I used to visualize my bestselling book in the window of a book store, my name as the author in bold print and all the people who ever doubted me, made fun of me or were mean to me would then look at me at wonder and awe. At forty-six, I really could care less about those people now. Maybe when you are younger, you feel as if you have to prove to yourself and everyone else you are good enough, better even. Mid-life, you generally don’t care what people think about you so much. You know by now that everyone is about the same. We all have the same general insecurities about ourselves even those people in high school that seemed to have it all together. So now I need to think outside of the box. What is it I really want to do? Write about? Write for? It may come to me now and it may come to me later. I’m just going to follow my heart and my gut instinct about it all. I’ve spent way too many years ignoring it and spinning my wheels, wasting time. That doesn’t apply to just writing but most things in my life that haven’t worked out so well. It is a relief to just let go of something that must not really matter to me, becoming a best-selling author or at least a well-known author whose book shows up somewhere on one of those lists and bookstore shelves. I didn’t have designs on being the next Nora Roberts or James Patterson, anyway. Which again, is proof that maybe my dream wasn’t quite right for me. That’s the cool thing about mid-life, you start stepping back and figuring out what you’ve been doing not for yourself but because you thought you should do it for whatever reason. You start finding the freedom to just be yourself. Do what you want. Do what you love. Yes, there are still those pesky bills and responsibilities but it is truly like getting a second chance or second act. You just may have to go about your dreams in a less traditional route. Or find you have new dreams. It’s actually quite exciting. Getting older doesn’t automatically mean you have to give up and not enjoy your life. Wear polyester pants with elastic waistbands in pastel colors with a matching jacket (unless you love this look) and letting your hair go grey as you rock out your last years on the front porch or recliner watching The Price is Right. Because your kids have grown doesn’t mean your life is over either. It’s a bit of a shock at first when your life quiets suddenly but you will find your happiness and a new type of relationship with your children. I had a bit of an adjustment period that was not enjoyable at all. Now, I love my girls being older. We hang out and do things together. It’s a lot less pressure for me because I don’t have to monitor every move they make. They’re adults now. It’s freeing for me. I don’t know what my next step will be when it comes to my writing but whatever it is, I am going to make sure it is something I truly want and love. No more “should do”. I can’t wait to see what else is in store for me. Maybe something that encompasses my love of traveling locally, hiking and biking. That is definitely something I love, I could easily incorporate my writing into maybe narrating and providing information on the places I discover and love. I love adventures. Till next time and thank you for reading my blog! Hugs!